Should we say no to Nonylphenol? The ocean is approximately 1.3 billion cubic kilometers (Eakins, 2010). A single cubic kilometer can hold 400,000 Olympic-sized pools. So much does it really matter if human-made chemicals end up in our oceans? What could such small concentrations of chemicals really do to marine organisms? These are the questions that are fueling my research project this summer at the Hollings Marine Laboratory. I have the privilege of working in the lab of Dr. Cheryl Woodley, who specializes in marine toxicology and coral health. Here I will be using two environmentally and biologically important marine organisms – sea urchins and coral – to understand more about the effects of manmade chemicals on the health and development of marine life. Of course, given our limited time I am not going to investigate all of the over 70,000 different chemicals produced by the US. I will focus on the compound nonylphenol, which has been recognized by the US Environmental Protection Agency (EPA) as a chemical of emerging concern (US EPA, 2012). This forbidding title is given to chemicals that have been recently detected in the natural environment that are believed to have harmful effects on humans and natural wildlife. Nonylphenol is added to products as a detergent, as it helps dissolve oils and other compounds more easily in water, and is produced and distributed in very large quantities. Approximately 500 million pounds of nonylphenol is produced every year, although in the last ten years the EPA has developed new rules to attempt to limit its application in products (Helmut, 2002; US EPA, 2016). It is used in most commercial laundry detergents, soaps and cleaners, meaning that it often funnels down the drain and into wastewater treatment plants, or even directly into seawater . Unfortunately, nonylphenol isn’t broken down easily and is moderately bioaccumulative, meaning that it collects and remains in the systems of organisms that come into contact with the chemical. Another element of nonylphenol’s chemical story is that it is an endocrine disruptor. This means that nonylphenol behaves like a common biological hormone, estrogen, and can negatively impact the hormonal systems of organisms. Marine invertebrates are particularly vulnerable to endocrine disruptors because many, including sea urchins and coral, exist as tiny, free-swimming organisms at early stages of development. Early embryos and larvae are known to be more susceptible to the effects of toxins, particularly hormonal disruptors, than adult organisms (Shirdel, 2016). This summer I will work with the gametes (egg and sperm) and juveniles of the lovely sea urchin Lytechinus variegatus. This species of urchin is native to much of coastal South America as well as Florida and South Carolina. I will see how sea urchin sperm responds to nonylphenol at different concentrations, and whether or not exposure affects the ability of sperm to fertilize eggs. I will also watch the development of sea urchin larvae exposed to the chemical to see if nonylphenol changes the pace or physiology of developing urchins. Finally, I will investigate the effects of nonylphenol on regrowth and regeneration of one of the most important organisms in our oceans: coral. Coral reefs host nearly a quarter of all marine species and are critical to maintaining the biodiversity and resources that we derive from the oceans (Coral Reef Alliance, 2017). If you want to know more about coral reefs and maintaining reef health, you can follow the Coral Reef Alliance blog, which releases recent information about efforts to protect coral. I will be examining how a threatened species of coral, Acropora cervicornis, responds to nonylphenol. To do this I will see how nonylphenol influences the speed and effectiveness of recovery if the coral tissue is injured and then exposed to the chemical. I will also gauge how healthy the coral is by measuring how much the coral is photosynthesizing, which will tell us about how much energy it is producing. I am very excited to be working with two incredible marine model organisms, and investigate such a prevalent and interesting compound! Our results will hopefully better inform the US EPA and other organizations about the threats of nonylphenol to marine aquatic environments and the many organisms that may be exposed at different stages of their lifecycle. Many thanks to Dr. Cheryl Woodley for welcoming me into her lab, and to the Fort Johnson Summer REU program for giving us this incredible experience. International Trade Administration. Chemical Spotlight: “The Chemical Industry in the United States.” Select USA; US Department of Commerce. Web. https://www.selectusa.gov/chemical-industry-united-states. Accessed Jun 22, 2017. US EPA., 2012. DfE Alternatives Assessment for Nonylphenol Ethoxylates. Design for the Environment. United States Environmental Protection Agency. pp. 2-27. US EPA., 2016. Nonylphenol and Nonylphenol Ethoxylates: Assessing and Managing Chemicals under TSCA. United States Environmental Protection Agency, 2 Nov. 2016. Web. https://www.epa.gov/assessing-and-managing-chemicals-under-tsca/risk-management-nonylphenol-and-nonylphenol-ethoxylates. Accessed 12 Jun, 2017. Kay, Jane. D4 and nonylphenol in textiles, plastics. Environmental Health News. May 6, 2013. Web. http://www.environmentalhealthnews.org/ehs/news/2013/d4-and-nonylphenol. Accessed June 20, 2017. Brown, Mark Anthony et al. Microplastic moves pollutants and additives to worms, reducing functions linked to health and biodiversity. Current Biology. 23 (23): 2388-2392. Eakins, B.W. and G.F. Sharman, Volumes of the World’s Oceans from ETOPO1, NOAA National Geophysical Data Center, Boulder, CO, 2010. Amphibians, including frogs, toads, salamanders, newts, and others, are experiencing large declines in populations worldwide1. Many factors human-caused factors are contributing to this decline, including habitat loss, to climate change, and pollution1. One way that habitats are being damaged is by increased salinity in normally freshwater systems. Salt is getting into freshwater by use of salt road deicers, poor land irrigation, rising tidelines, and increased storm surges2. Changes in water quality, such as salinity, is especially dangerous to amphibians such as frogs because of their permeable skin. In addition to increased salt levels harming adult frogs, it can damage developing frogs from fertilization onwards. 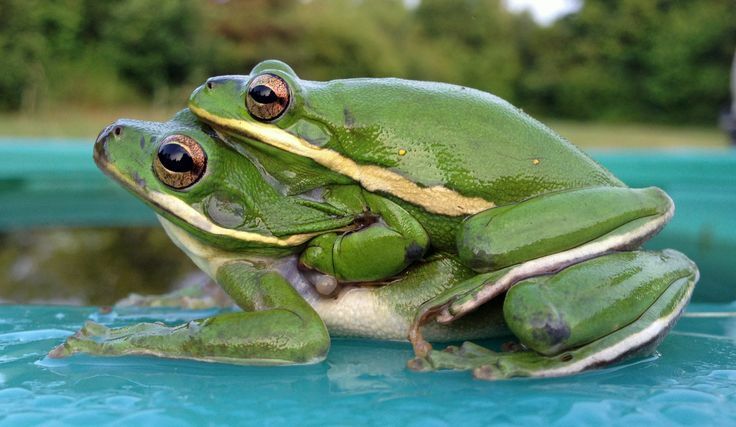 Almost all frogs are external fertilizers- that is, when they breed, male and female join in amplexus and release sperm and egg into the water. Frogs require freshwater to breed and develop as tadpoles, so when freshwater is intruded by salt, there are problems for frogs from their earliest stages. Many studies have shown that even low levels of salinity can cause tadpoles to develop abnormally, have lower adult weights, and die3 .While we already know that increased salinity has a bad effect on tadpoles, little is known about how this salinity affects frogs at the first stage of life: fertilization. We hope to look at the effects of salinity on sperm and fertilization, an area which has very little research currently. Previous research has shown that in squirrel treefrogs, low levels of salinity can stop eggs from being fertilized4. A study on green treefrog sperm showed that as salinity increased, sperm function decreased incrementally5. These two closely related species live in the Coastal Plains habitat, which is at risk of salinization by rising tides and storm surges. Sperm function and fertilization rates have been shown to be negatively by increased salinity- we look at these two effects in squirrel treefrogs and see if a decrease in sperm function can explain at least part of how salinity hinders fertilization. What can baby shrimp teach us about oil spills? Pretty much everyone knows that oil is toxic, unfortunately. We’ve all seen images of birds or otters covered in oil, or seen wetlands destroyed due to an oil spill. But what many people may not know is certain factors, even rays from the sun, can increase the toxicity of oil. UV light—what gives us sunburns—can increase the toxicity of oil by over 1000 times in some cases, which allows it to kill more organisms and damage more of the ecosystem. This is a big problem. And like in everything else, you can’t start solving a problem until you completely understand it. Before experts can start to clean up an oil spill, they have to make predictions, and determine how toxic the oil is going to be, what organisms are going to be more sensitive to it, and what conditions exist that could make the oil more toxic. Which is where my research comes in! This summer, I’m studying the effects of oil on larval grass shrimp. They’re kind of cute little creatures: as larvae, they swim upside-down, and have giant eyes. Most importantly, as adults, they’re very important to the ecosystem. They’re an important food source for many larger fish and crabs, and they’re also detrivores, meaning they break down waste on the seafloor into smaller pieces, that tiny organisms such as plankton can eat. Therefore, they’re important for organisms both at the top and bottom of the food chain, and if their populations are harmed, it can have a huge negative impact on a large number of other organisms. Specifically, my work this summer is focusing on the toxic effects of thin oil sheens and oil mixed in with sediment, as well as the developmental effects of oil. Previously, some studies have worked to determine that very thin oil sheens can be toxic, but they largely focused on deep-water organisms, not estuarine species. My study will work to determine how thin oil sheens can affect estuarine species. In addition, the sediment tests will determine how estuarine species might be affected by oil sinking down after a spill- a situation they are often exposed to. Both these studies will also evaluate what impact UV light has on oil in these situations. Finally, studying the impact of oil on shrimp development will help determine what the long-term affects an oil spill may have. All of this research will help people to make predictions about the damage that will occur in the event that an oil spill does occur in or near an estuary. I’d like to thank my mentors, Dr. Marie Delorenzo and Dr. Paul Pennington, for their guidance and NOAA for providing me with lab space and equipment. Finch, B.; Stubblefield, W. Photo-enhanced toxicity of fluoroanthene to Gulf of Mexico marine organisms at different larval ages and ultraviolet light intensities. Environmental Toxicology and Chemistry. 2015, 35, 1113-1122. Does anything even remotely familiar come to mind when you read those words? If you’re like most people, the answer is probably “no”. However, this strange red seaweed is actually quite ubiquitous, and chances are it dwells somewhere along the coast of the country you live in. To most of the world, Gracilaria vermiculophylla is an invasive organism—Unless of course you live in East Asia, where it is considered to originate from. Outside of East Asia however, human activities have carried this organism far and wide. Of those activities, the trading of Japanese oysters to the rest of the world is believed to play the biggest role in transporting Gracilaria to new environments. Above all, what makes Gracilaria so remarkable is that it can thrive in many different types of conditions all over the world. For example, Gracilaria can easily be found along the coastline right here in Charleston, but the climate in Charleston is very different from its native environment in Japan. Gracilaria’s remarkable ability to adapt to its environment makes it an interesting organism to study. Gracilaria vermiculophylla found along Grice Beach, Charleston, South Carolina. Photo Credit: Melanie Herrera. Given that, I will be researching Gracilaria with Dr. Erik Sotka at Grice Marine Laboratory. My research will attempt to uncover some of the reasons why Gracilaria is able to thrive in so many different environments, and what allows other invasive species to thrive in varying conditions. Past research has found that heat shock proteins (Hsps) may play a role in Gracilaria’s ability to survive. Hsps are molecules found inside most living organisms that regulate the functions of the cells and thus keep the organism alive during high stress events (extreme temperatures, or in the case of marine organisms, extremely high or salinity levels). In response to that, researchers have recently developed what are known as inhibitors. Inhibitors are tools that halt the functions of Heat Shock Proteins. We believe that giving inhibitors to Gracilaria can halt the functions of their Hsps, and we can use that information to gain insight about the stress tolerance of Gracilaria, and ultimately other marine organisms. To do this, I will be harvesting lots of Gracilaria form Charleston Harbor, giving them inhibitors, and subjecting them to extreme temperatures and salinity levels to see how they respond. Additionally, we hope that the data we generate can inform predictions about the health of other marine organisms as ocean temperatures rise due to climate change. I want to dedicate some words of appreciation Dr. Erik Sotka, Benjamin Flanagan, Dr. Bob Podolsky, Grice Marine lab The College of Charleston, and the NSF for this wonderful opportunity. Sørensen, J. G., Kristensen, T. N. and Loeschcke, V. (2003). The evolutionary and ecological role of heat shock proteins. Ecol. Lett. 6, 1025–1037. Queitsch, C., Sangster, T. a and Lindquist, S. (2002). Hsp90 as a capacitor of phenotypic variation. Nature 417, 618–24. Krueger-Hadfield, S. A., Kollars, N. M., Strand, A. E., Byers, J. E., Shainker, S. J., Terada, R., Greig, T. W., Hammann, M., Murray, D. C., Weinberger, F., et al. (2017). Genetic identification of source and likely vector of a widespread marine invader. Ecol. Evol.